Sir, May I know that it will be applicable for UDCs of MES. As per MACP UDCs is to be given Grade Pay of Rs. 2800/- on grant of 2nd ACP. 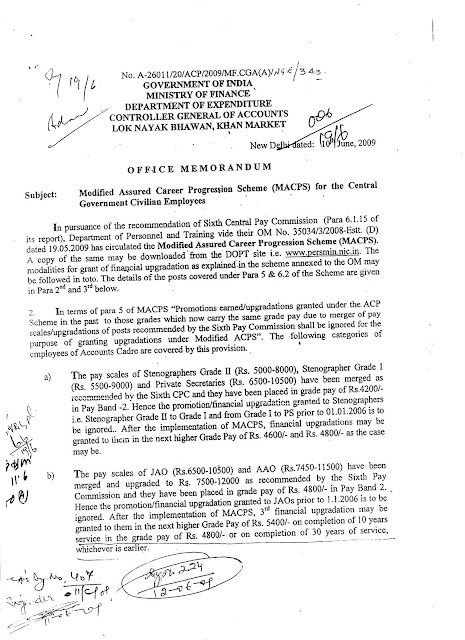 And UDCs who have granted 2nd ACP before 1.1.2006 have been given Grade Pay of Rs. 4200/-. Please confirm that UDCs of MES will be given Grade Pay of Rs. 4200/- as the same is in their heirarchy. As Grade pay Rs. 2800/- is not in their hierarchy as Grade Pay of Office Supdt is Rs. 4200/-. Please clarify. There are somany such anomalies to be corrected and clarified. Hello Sir,I have completed 21 years of service,my present grade pay is 2800 ,according to macp can i eligible for next higher grade pay that is 4200.
when will be 60% arrears given. wheather the employees who have already got TBOP they will entitle to get another promotion on complition of 20 years service or not? what will be the pay band with grade pay for MACP. I got OLD ACP Scale 5000-8000 from Aug 99. Sub:regarding fixantion of pay in 6 CPC. As on 01.01.2006 my pay was Rs.5850/= in the scle 5500-9000 i got the promotion as SO(Accounts) in May,2006 and pay was fixed Rs.6500 in the scale 6500-10500 which was the minimum of the scale as per FR-22.After implementation of 6th CPC , my pay was fixed in this manner i.e. 5850*1.86+one notional increment +4800=Rs.16020 (In the grade pay 4800). Which is much lower than direct recruitee in the grade pay 4800 who are getting Rs.18150.My pay has been fixed even lower than a direct recruitee in the grade pay 4600 who are getting Rs.17100(approx). Any comment/suggestion in this regard will be highly solicited. Sr. Accounts Officer of our office attended one training programme about MACP in INGAF, Chennai where they have informed that this order is applicable only those stenographers working in Secretariate. Why such partiality.... Anybody, please inform the latest position about this order. As per Clarification of Ministry of Finance and Expenditure, vide letter 10th June 2009, there is no mention that these orders will be applicable to Central Sectt. Stenographers. All Stenographers working in and outside subordinate central govt. offices are eligible for their upgradation in grade pay of Rs 4600 and Rs. 4800. If I am not mistaken, those who are in Grade I may get Rs. 4600 and in PS grade may get Rs. 4800 w.e.f. 1.9.08. Merge GP 4600 & GP 4800.This is only to restrict PB-2 employees financial prospects. Im in grade pay Rs 5400 afetr ACP. My original grade pay is 4200 as when i joined service. Am i eligible to fly? I was employed in AD Static Wksp, Gopalpur in Min of Defence as a Telecom Mech(Rdr Mech)in Apr 1997. I was elevated to MCM in Apr 2008 with revised grade pay of 4200. Whether I should get next higher grade pay of 4600 in Sep 2008 as per MACP. Please clarify the matter as it is an urgent case. the macps seems no benefited and demoralize to senior subordinate officers in cisf as no rank structure is there in this deptt. for grade pay of Rs.4800/-. It is requested that they should not be forced to get grade pay of Rs.4800/- where as they are entitled to get the pay of their next rank i.e AC, gp Rs.5400/-. If the confidential report is said to be below average and three members of committee has declared it not suitable even after there is no mistake in the work of the employee then will he/she will be given the 4600 payband? I am working in the same post from last 14years... At present am in 9300 grade..
clarifications and modifications alike does not matter much now. when and how much the MACP PAYMENT and its arrears ..? something to know this ..? I am Ashoka Mandle Steno Grade-II i got promoted on 06 Nov 2009. I am posted in Pachmarhi where post of Steno Grade I not auth. So i want to know whether i am eligible for next promotion in due date or not? please clarify. I have been transferred from an autonomous body to Central Govt. Unit on permanent absorption basis in the same Department. I am in 9300-34000 Pay Range with 4200/- GP. I have completed 10 years including 5 years in the autonomous body. Could somebody may clarify, whether I will get my first financial upgradation or not. If yes, is there any clarification from DPT is available. 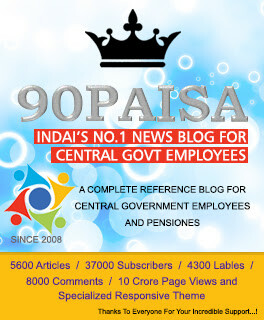 an employee joined govt service on 1-07-1978 in the pre-revised pay scale of rs 4000-6000, he promoted in the pre-revised pay scale of rs 5000-8000, he got financial up gradation in the pre -revised pay scale of rs 5500-9000 what he will get financial up gradation under the Acp scheme .? I have appointed as a Mt fitter in 1998. as per 6th CPC I got 1900/- grade pay, after getting financial upgradation now i am getting 2000/-.What is the benefit after completing 10years in defence civilian service? Sir after completing huge time of 10yrs service LDC getting benifit of 100/- only in GP is this justice. Govt ne itna bhi kyon diya sir govt ise bhi rakh le kam aayega. And then I got my promotion as a Junior Accountant on 18,Nov 2004 BUT I didn't get any benefit on my PAY SCALE by this PROMOTION. AND PLEASE TELL ME SIR THAT I AM ELLIGIBLE FOR MACP OR NOT ? My appointment 2800 GP in year 1987.
got first promotion of 4200 GP in year 1990. Second regular promotion of GP 4600 in year 2003. When I will be eligible for 4800 GP in MACP. Sir may i know that when i joined grade D in 1992 in subordinate office i got my ACP in 2002,and then i got my promotion letter in grade C in 2012. 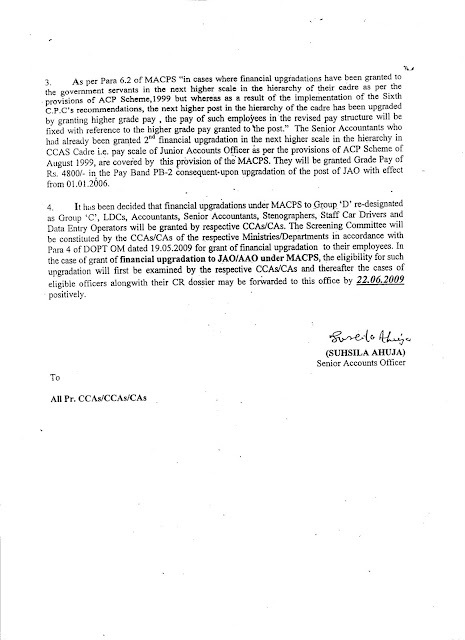 My MACP is due in 2012.I want to tell you that my pay bend is Rs 9300-34800 ,grade pay is 4200. I just want to know that what is my grade pay in MACP now? ?